Hello and thanks for visiting our Webpage! We have many items to offer at great prices, and we hope that you can find what you need here. ATTENTION! Please read the ENTIRE page below so that you understand our policies, and to help make sure that your order goes more smoothly with the least amount of complications. By you understanding our policies before you order, this will make for a better experience for you, and help us maintain our FREE SHIPPING policy. FREE SHIPPING - Worldwide - We are offering "FREE SHIPPING" on everything you ordered and it is Free to virtually any address in the world. We are able to pass on this great savings to you due to our massive volume. All items are shipped to you FREE. Over 80% of our shipments usually arrive within 8 days and no later than 9 to 14 days on average. Delays may be caused by weather, holidays and sometimes clearing customs. Most of our packages are shipped through Postal Services and package transit times are estimates and not guarantees. International Orders - Free shipping does not include Custom Duty / Tax collected by your country and it is the buyer's liability for any such tax. Every country has different custom entry policy. We will supply all required entry documents and it is also buyer's responsibility to contact and submit required document requests by your local custom. There's no Custom Duty fees for USA buyers. Please email us at service@madhornets.com for a shipping quote. Order Tracking - Delivery Confirmation numbers for package tracking will be sent to you via email once your order is prepared and shipped. You may also find these numbers stored in "my account" at MadHornets.com for your convenience. Most of our orders are shipped via USPS, or as otherwise stated. To track your package, please visit USPS.com . Shipping - We can ship to virtually any address in the world. Note that there are restrictions on some products, and some products cannot be shipped to international destinations. When you place an order, we will estimate shipping and delivery dates for you based on the availability of your items. Depending on the shipping provider, shipping date estimates may appear on the shipping quotes page. Shipping - for Fairing Bodywork only - All of our fairing bodyworks are "fresh painted". Fairings are not painted till the customer places an order. Paint Jobs will take about 7 to 12 days. The fresh paint and decal will ensure the best quality possible for the fairings you ordered. It will then take about 5 to 10 working days for the package to transit. The total number of days for you to receive your shipment is about 17 to 22 days. Order Fulfillment - Some items are filled from our overseas warehouse due to the item's availability. No worries, Shipping is still FREE to you and deliveries are within the transit time listed above. Again, shipments are estimated to arrive within 8 days and no more than 9 to 14 days on average. -"undeliverable as addressed" and "unclaimed" could result from a wrong address that was provided, having moved, contact information changes, unavailable at the time of deliveries...etc. If the package was returned to us as "undeliverable as addressed" or "unclaimed", a 30% re-shipment fee will apply to your account. Package may be re-sent to you after return is received and a 30% fee is paid. - If order is cancelled after shipment was sent and posted, a 30% restocking fee will apply to your account. The partial refund will issue to original payment account after the return is received. 30% Restocking fee also apply to wrong product ordered. The 30% restocking fee basically covered the original shipping charges. Please help us to maintain our ability to offer "FREE SHIPPING" to you by correctly entering your address, contact information, and availability at the time of delivery. Following these simple steps will GREATLY increase the ability for a hassle-Free delivery. MadHornets.com offer items shipped FREE to you but in case there's a return, you are covering the return shipping charges to MadHornets.com located at California, USA 92880-3549. If you need to return an item, simply login to your account, view the order using the "Complete Orders" link under the "My Account" menu and click the Return Item(s) button. We'll notify you via e-mail of your return once we've received and processed the returned item. You may return most new, unopened items within 15 days of delivery for a refund. We'll also pay the return shipping costs if the return is a result of our error (you received an incorrect or defective item, etc.). NO return accepted for special orders. NO return accepted for custom paint fairings. * 15-Day return period - Please be sure that your returned item is shipped (post marked) to MadHornets.com within 15 days of the date it was delivered to you (as shown on delivery company's tracking system). * Original packaging in good condition - Please note that all items will have to include all original packaging in good condition. (Free from scratches, blemishes, tears, dents, and markings - including writing of any kind,etc.) If MadHornet.com receivesyour return damaged or missing, the original packaging the item will be rejected. * Unused condition - MadHornets.com is unable to accept returned items that have been installed, used or damaged. * Closeout items - MadHornets.com does not accept returns of items purchased on closeout. In some cases, we may allow a closeout item to be returned for MadHornets Store Credit. Please contact Customer Service. * Restocking fees - All return items are subject to at least a 30% restocking fee. MadHornets.com will always try to offer it's best service to your experience with us and would love to resolve any issue that may occur. To avoid abuse of bank charge backs, all charge backs you file will be subject to a $150 file and investigation fee. If you have any questions, please email us at service@madhornets.com or via facebook. MadHornets.com is an independent business selling aftermarket parts and accessories for American and imported motorcycles, Cars, Trucks, SUVs and ATV. We are in no way connected with Harley-Davidson, Inc.®, American Honda Motor Company, Inc.®,Kawasaki Motors Corporation®, Yamaha Corporation of America®, American Suzuki Motor Corporation® or Victory® manufacturers of motorcycles and any of their marketing affiliates. We are in no way connected with ALL American and Imported Cars, Trucks, SUVs and ATVs, also any of their marketing affiliates. We do not sell motorcycles manufactured by Harley-Davidson®, Honda®, Kawasaki®,Suzuki®, Victory® and Yamaha®. We do not sell any Cars, Trucks, SUVs and ATVs, that is manufactured in USA or Imported. Except as may be expressly set forth in the product invoice, MadHornets.com makes no representations or warranties as to any of the products distributed by us, expressed or implied, including without limitation any warranties of merchantability or fitness for a particular purpose. Motorcycles can be dangerous. MadHornets.com has no control over the usage of any part. MadHornets.com expects their customers to exercise good judgment as to the proper selection, installation, use and maintenance of any part. MadHornets.com assumes no responsibility for damage or injury of any kind because of the misuse or improper application of any part in any way by any person. MadHornets.com shall not be liable for any indirect or consequential damages whatsoever. All matters shall be interpreted under California law. All merchandise distributed by MadHornets.com is guaranteed against defects in material and workmanship only. Final decision will be made in a just and prompt manner. Replacement will be limited to parts only and does not include labor claims of any type. If the manufacturer has a written warranty, it will be included with the item you purchased. The manufacturer shall be solely responsible for any damage to person or property arising from design and manufacture and testing of its products and we accept no liability for such damages. We shall not be liable for consequential damages. 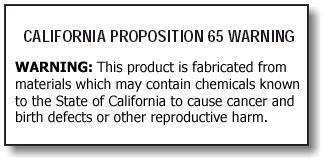 It is our responsiblity to post this Propositon 65 warning to our California Buyers.